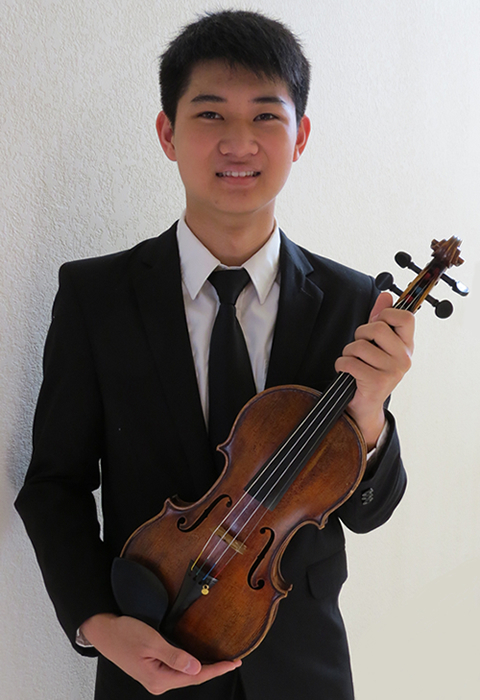 Johnathan Wu, 15, started his violin studies at the age of 3 with Paul Landefield and continued with Jan Mark Sloman at age 8. He has attended summer festivals such as the Intermountain Suzuki String institute at Salt Lake City, and the Colorado Suzuki Institute at Beaver Creek, both with honor recital performances yearly. He has also attended The Institute for Strings in Dallas, a chamber music summer program for dedicated young musicians in developing skills and disciplines that chamber music demands. There he has worked with experienced and dedicated coaches such as Cathy Forbes, Mary Reynolds, Jim Higgins, and Yuri Anshelevich. Johnathan recently began attending The Meadowmount School of Music last year, making this his second year, as scholarship recipient, working with chamber coaches such as Ivan Zenaty and Patricia McCarty. He has participated and placed as winner in competitions including the Hubbard Chamber Music Competition, Dallas Symphonic Festival, Music Teachers National Association (MTNA) competition, TexASTA solo competition, and the Lewisville Lake Vernell Gregg Young Artists Competition. Recently, he has been awarded the alternate of Texas MTNA, honorable mention in TexASTA, second place in the Lewisville Lake Vernell Gregg Young Artists Competition, and a winner of the Chamber Music International solo competition.